Wow, was this ever shaping up to be quite the cultural exchange. 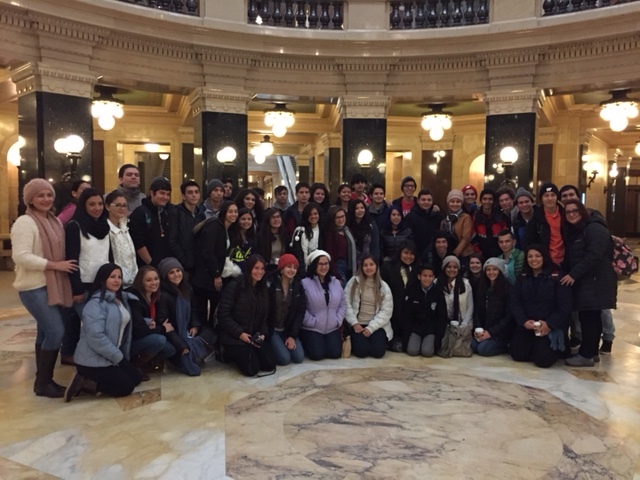 After last year’s inaugural exchange, this year 50+ students and teachers from Costa Rica would brave a two week winter wonderland in Wisconsin in January, and after receiving consecutive weekend snowstorms in December, I assumed snow would be the least of our worries. Fast forward to our 40 degree arrival and having to strain my eyes to pick out any recognizable snow banks as we pulled into the high school parking lot Friday night in Madison, WI. Besides staying with a family and practicing English, snow was a key trip feature that had enticed students to come in the first place. Maybe they wouldn’t miss the snow (I sure wouldn’t) and I could smooth the disappointment by blaming global warming (assuming they believed that I believed it was real). Luckily, there was a big enough distraction for the lack of snow, and that was the Presidential inauguration, which was happening the day we arrived. Students were quick to sprint into their families arms at the pickup, probably due to not having any winter clothes, but just as much due to the excitement of meeting the family. It couldn’t have been long before the topic came up though, as the town was abuzz with the Women’s march scheduled to happen the first full day the students were in town. Those students that were interested were treated to an opportunity of a lifetime to see the march. There is never not a good time for a cultural exchange, but there are times when exchanges are more necessary than others, and the next four years will definitively be important for cultural exchanges. Especially with all the fake news and demeaning rhetoric, personal experience is going to end up being the only credible means to get an authentic view of the United States and its people. 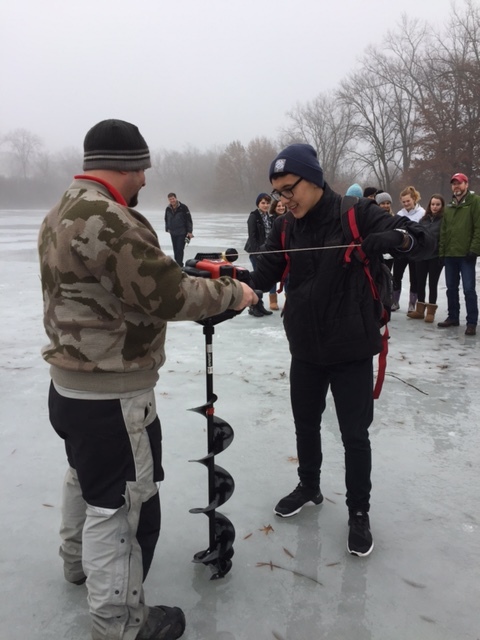 Luckily the ice was thick enough to drill holes in it? had to cancel our sledding and move ice skating to indoor venues, which hadn’t bothered the students one bit, however I felt like we were letting them down. Fortunately, there was some snow in the forecast for the Chicago trip, but nothing to get excited about, yet. One thing I always joked with the teachers was how difficult it is to plan a snow day into the itinerary. We had to assure that all our host schools would close for the day and then figure out how to rearrange the schedule to still get everything in around the snow day. Well sure enough, the day of the Chicago trip we began the day under a winter weather watch. Our departure was scheduled for 6:30am and by 6am the first host school had already closed for the day. That was great for those students, but I was still inclined to get them on the bus so they wouldn’t miss out on Chicago. Then, about 15min later, Madison schools closed. That knocked out another school and we only needed one more school to close for the trifecta. Madison schools are one of those districts where they only close if they are expecting the worst, so based on that information I was ready to cancel the trip and send the remaining students to the high school to shadow, when the message board began lighting up signaling that their school had been closed too. I don’t think anyone could have exhaled longer or more deeply than I did at that moment. Gone was the necessity to make a tricky decision and potentially put students at risk, and I picked up a much needed catch-up day to re-confirm and re-arrange activities with the snow day having now been added to the itinerary. 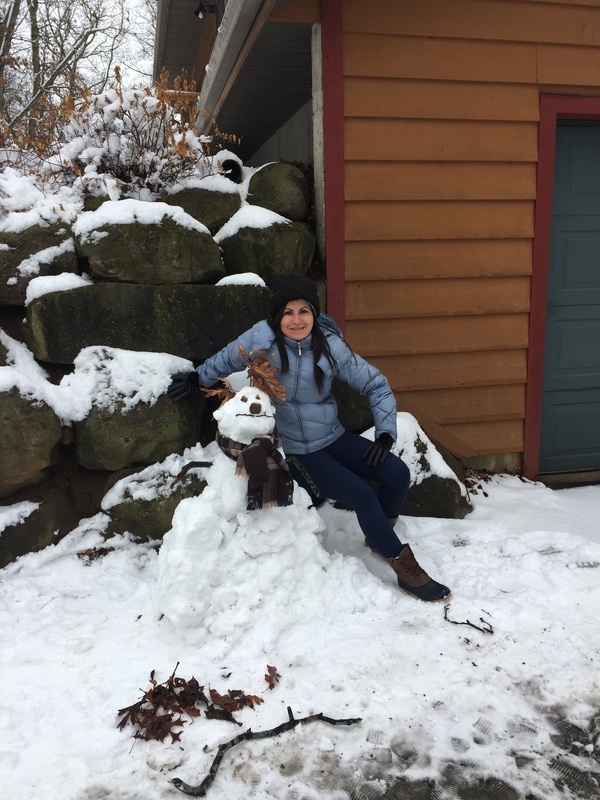 I still found time to make a snowman and even do some shopping, but what was most satisfying was watching the photos come in of everyone out in the snow (of course, with me tucked in at home in front of a warm fire). Thank goodness for the snow day, as it came right in the middle of the exchange and proved to be the only opportunity to catch our breaths. The students didn’t need any downtime, but it was invaluable for the families and teachers. The reactions from the visiting teachers were also very interesting as a lot of them had been to the United States before, but had gone to places such as Disney or New York, or went to visit Costa Ricans already living in the United States. It was interesting because they already had experience, but having a family stay was completely new for them. They saw a lot of things on their previous trips to the US, but didn’t have the chance to necessarily experience them. For example, a host family treated our group to a bonfire and taught them how to make smores. This was something that even if you had been to the US, you wouldn’t have experienced unless you were with a family. Also, for being Wisconsin, the teacher’s hosts made sure they got to experience a brewery tour, which was definitively a novelty coming from Costa Rica. Thankfully, the snow day was a dream come true for everyone and we still managed to fit in most of our activities. What really made the experience stick though were the going away parties. At the parties you could really see how much the students and families had bonded over the two week experiences and they displayed their affection in various ways. 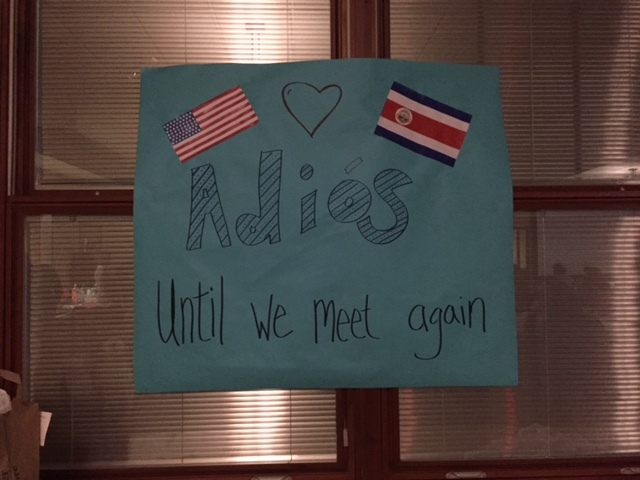 Some made banners to say good bye, one student put together a video of the experience, and everyone made sure to sign each other’s t-shirts as a going away momento. I addressed the families, but I didn’t have much to say. By then everyone had created their own experience and at most I could do was recount what I had told the families at our pre-trip meetings in that the experience you will make on your own and no two experiences will be alike. The “tingling” sensation that you get when you are sharing your culture impacts people in a variety of different ways and I couldn’t possibly give a blanket explanation that would cover everyone’s experience. I’m super thankful for the families that opened their homes for this experience and I hope they will continue to communicate with their exchange students and encourage other families to take part in this experience. We won’t get inaugurations nor snow storms every year, but in the end that won’t really matter, despite all the hype we give it. What will matter is the experience itself and how it can impact one’s future. All home safe and sound, I can take another big exhale knowing I won’t have to worry about snow again till next year. This post was written by Dustin Dresser, director at Costa Rica Frika and winter exchange trip coordinator. Dustin is from the Madison, WI area and now lives in Costa Rica with his Costa Rica wife. 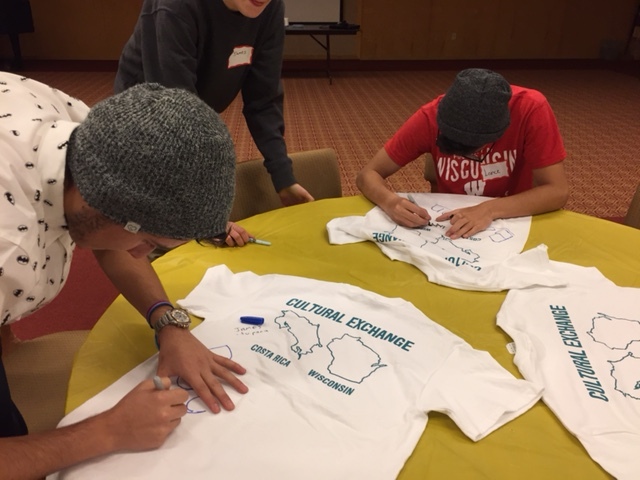 You can read about the 2016 winter exchange here, and find out more about exchange opportunities here.